THE EFFECTS OF MULTITASKING IN THE CLASSROOM were investigated in students in an upper level Communications course. Two groups of students heard the same exact lecture and tested immediately following the lecture. One group of students was allowed to use their laptops to engage in browsing, search, and/or social computing behaviors during the lecture. Students in the second condition were asked to keep their laptops closed for the duration of the lecture. Students in the open laptop condition suffered decrements on traditional measures of memory for lecture content. A second experiment replicated the results of the first. Data were further analyzed by “browsing style.” Results are discussed from Lang’s Limited Process Capacity model in an attempt to better understand the mechanisms involved in the decrement. Helene Hembrooke is the Associate Director for the Human Computer Interaction Group (HCI Group). After receiving her PhD in 1993 from Binghamton University in Upstate NY. She spent the next five years conducting research aimed at investigating issues of attention, perception, learning, and memory, and how these processes change in early childhood. Some of her research with the HCI Group is aimed at investigating search behavior as it applies both to better system, interface design, and metadata extraction, as well as the potential relevance this research has for the field of cognitive psychology. In addition to this work, Dr. Hembrooke has begun a series of experiments using eye tracking equipment to monitor differences in browsing and search behavior on various Web sites. Combining this with other data on location and movement, her intention is to look at ways to predict movement in virtual spaces as a function of the spaces’ configural properties. Geri Gay is director of the Human Computer Interaction Group (HCI Group) and a professor at Cornell University in the department of Communication and Information Sciences. The HCI Group is a research and development group whose members design and research the use of computer-mediated learning environments. Professor Gay’s research interests focus on cognitive and social issues for the design and use of interactive communication technologies. Past research has explored navigation issues, knowledge management, mental models and metaphors, knowledge representations, collaborative work and learning, and system design. 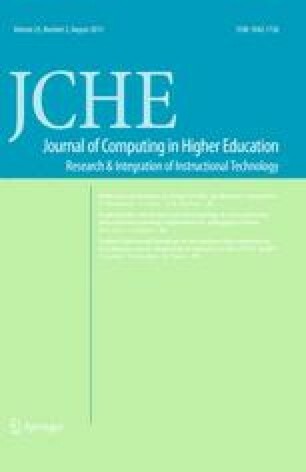 Recently she has published inIEEE, International Journal of Human Computer-Interaction, Journal of Computer-Mediated Communication, CHI, HICCS, ACM Digital Libraries andACM CSCL. She coeditedInformation Technologies in Evaluation; Social, Moral, Epistemological and Practical Implications (1999), Jossey-Bass Publishers and is coauthoringActivity Based Design (in press), MIT Press.